A classic cobbler is just gin, sugar and some fruit as a garnish. Savoy and Café Royal have a Grape Fruit cocktail, but it is not listed as a cobbler, which has its own section at the back of the book. Lommebogen’s recipe is the same as Café Royal, so I’m just going to ignore Axel calling it a cobbler.Though I suppose you could blur the line a little bit topping it with some grapefruit as well. The Savoy recipe is quite different in that it uses grapefruit marmalade instead of juice. That is kind of a PITA for me to track down, so I didn’t bother making that one, though it sounds like it would be good too. So the Lommebogen version should be equal parts of the three ingredients, but 1 oz. of sugar comes to two tablespoons, which just sounds like way too much. I went with the Café Royal “sugar to taste.” I ended up using 2 teaspoons and that was still a bit too sweet. I think I would be fine with 1 teaspoon of sugar on this one, but I suppose that also depends on how sweet your grapefuit is. 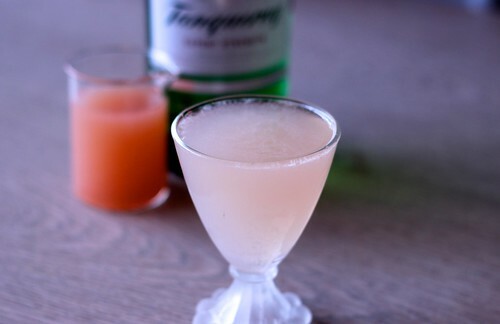 This is a simple and very tasty cocktail if you happen to love grapefruit juice, which I very much do.